This week we’ll head over to another charming farmhouse with amazing bones. A great house with huge, gorgeous windows overlooking a verdant landscape as it turns to all the beautiful colors of fall. For this kitchen remodel, we used organic colors–brick-red tile, natural wood and a lovely robin’s egg blue for the kitchen island, and pops of sunny yellow in the sunroom. A farmhouse wouldn’t be complete without a bib sink; we chose an oil rubbed bronze finish for the faucet and countertops the color of creamy buttermilk. White walls and cabinets are a great way to allow features–such as the gorgeous cobalt blue AGA Cast Iron Range–to shine. This sunroom provides the perfect backdrop for fall decorating. 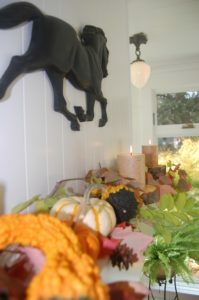 We used adorable petite pumpkins paired with fresh flowers in jewel-toned fall colors. The fireplace mantle is a great spot to go crazy with holiday decor: leaves from the garden, pumpkins, pine cones, and rustic wood candle holders complete the look. Skip the glitter–using gourds in a variety of colors and shapes is the best way to create a look that is rustic and unique. To see the rest of this remodel, head over here.